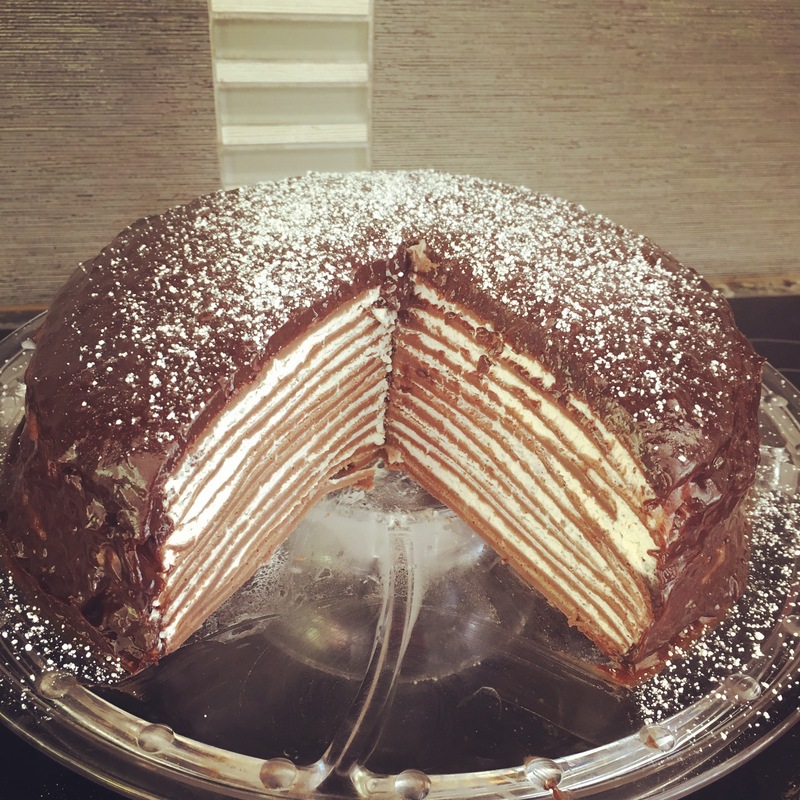 The inspiration to make this cake came from a BuzzFeed Tasty recipe video — you know, the ones where they make everything look effortless. Well let me just say, this recipe should have come with a disclaimer stating “previous crepe experience strongly advised”. Me, never before having made a crepe in my life, decided this would be a fun challenge. What I didn’t consider is that I should have DOUBLED the recipe, in order to practice a few crepes first; I was not prepared for the crepe casualties that would ensue (there were four). Yes, the batter is supposed to be watery; don’t worry, you didn’t ruin it. Pile the crepes on a plate as you make them and put them in the fridge to cool for at least an hour; I can’t stress enough that the crepes NEED to be cold to assemble the cake!! In hindsight, this is total common sense; something about those videos makes the recipes look like they’re foolproof, so I just started assembling things immediately like the video shows. If the crepes aren’t cold, the whipped cream will run. So again, make sure BOTH whipped cream and crepes are COLD! To start the broth, put bones in large pot and add water (I didn’t measure, I guess it was 8-10 cups of water). Add large splash of apple cider vinegar, a few Tbsp worth, and let soak for 30 minutes. Add all other ingredients (including 2 of the onions — save the other one for now) and bring to boil. Cover and turn heat down to low and let simmer for 20-24 hours (doing this in a slow cooker seems much more efficient, but mine is packed away). Remove veggies and bones; strain broth through strainer and set aside. When cooled, remove solidified fat from surface. Meanwhile, chop and cook kale until very tender (I just put it in a large pot with a little water and steamed it until tender). 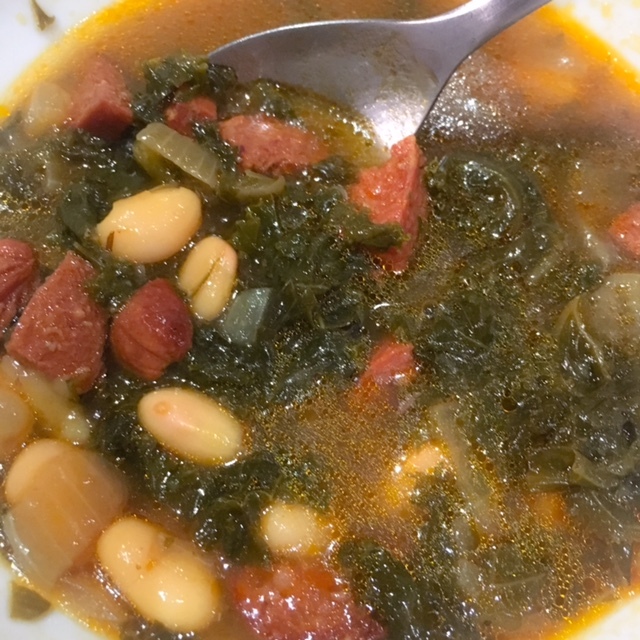 Chop and lightly crisp chorizo in pan; remove from pan and let drain on paper towel, removing excess grease (WARNING: you may want to hide cooling chorizo; husbands love to pick at this when you’re not looking and may not leave enough for the soup). Chop 1 onion and sautee in chorizo fat; sprinkle with large handful of flour, creating roux. Add a little broth to pan, stirring ’til smooth — this will help to give the soup some body. Add chorizo, kale, and thickened onion mixture to bone broth. Add water if you’d like more soup. Season to your liking (I used 2 T turmeric for a little nutritional boost, 2 T black pepper, and sea salt to taste). Let simmer on low for about one more hour. Drain and rinse white beans; stir into soup… that’s it! Now, all you need is some good bread to dip it in (or, not). We recently visited David’s brother, Elliott, in LA. 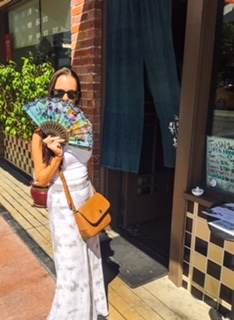 One of the things we did was explored Little Tokyo on the hunt for some good ramen. Based on Yelp reviews, we decided to try Mr. Ramen (with a name like that, it had to be good, right?) So the atmosphere itself felt like what I’d imagine a Tokyo ramen house might feel like — a little hole in the wall place where you can smell the broth as you enter the doorway, nothing fancy, run by very kind Japanese owners who smile alot. Cute little place. 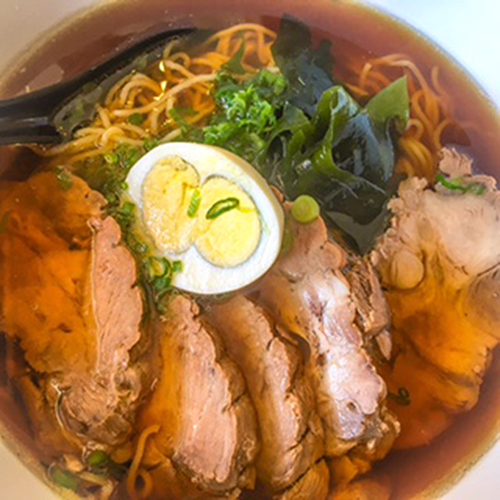 The menu offered a very wide variety of ramen noodle, meat and veg, and broth combinations. I went with the vegetable pork bone ramen, which featured a very rich, golden, salty-but-not-too-salty broth, sliced pork , noodles, egg, cabbage, and seaweed greens. This is a VERY filling and satisfying soup. 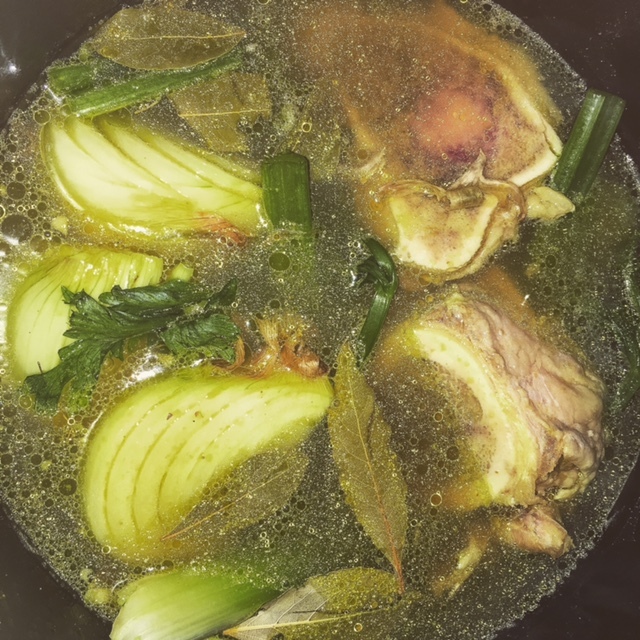 I felt instantly perked up by the broth alone, and as I ate it I imagined it to be something that would cure any sickness or hangover. Luckily, I had neither, just seemed very nutritious, while extremely enjoyable to eat. 10/10 would eat again. My husband and I got married over the summer in Costa Rica, and one of the things I loved the most about the country was all the fresh tropical fruit. Every morning, they served a fresh juice of some sort. 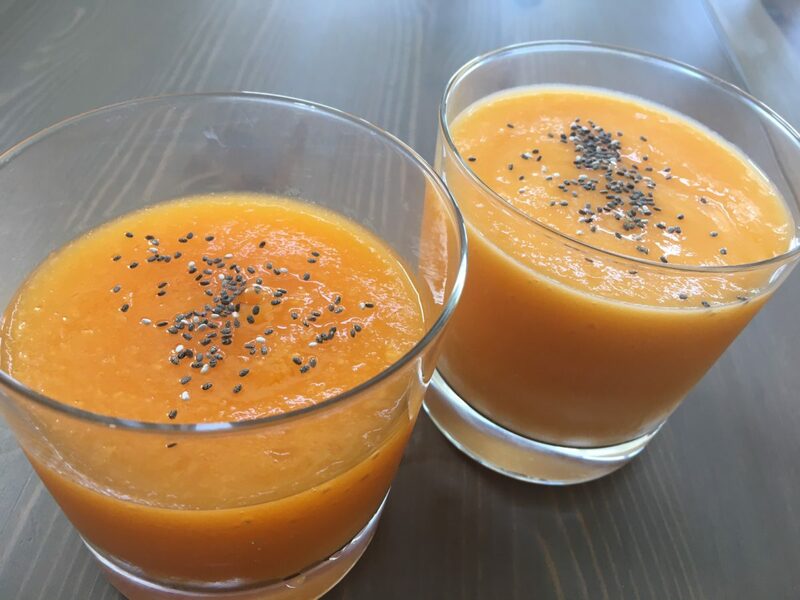 I’ve always loved papaya, not only for its countless nutritional benefits and flavor, but for its vibrant beauty. Costa Ricans love their papaya, too. Every day, we’d visit the local “sodas”, which are the Costa Rican equivalent to the small American cafe, in search of some authentic Tico food. Batidos are the local drink, very similar to a smoothie, but only using fruit and either water or milk. You can either order it con leche (with milk, David’s preferrence), or con agua (my go-to). I fell in love with the very simple but delicious papaya-con-agua that became my morning staple there. To my delight, my new neighborhood is home to many papaya trees. Jeff brought a few the other day, and today I was very lucky to find a roadside tree loaded with them, ready to pick. Lately the papaya gods have been very good to me, showering me with brightly colored fruit… hallelujah! I froze some, ate some, and was finally reunited with my beloved batidos (con leche for David, con agua for me). It’s literally just straightup ripe fruit (NOT frozen, although you definitely could) blended with just a bit of either water or milk. 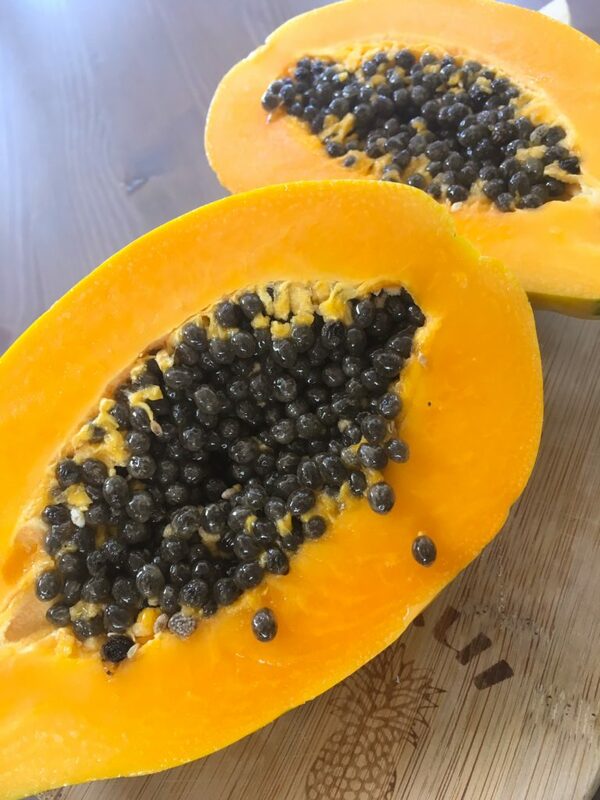 In Costa Rica, they’d add a little sugar, but these didn’t need any since these Maui papaya I find sweet enough on their own. Top them with a sprinkle of chia seeds, and there you have a delicious snack… muy bien! I. Love. Pies. Now you know. Pies of any form, savory, sweet. Whatever. Quiches have always been one of my favorite things to eat and are so much fun to make, because the options of ingredient combinations are endless. Tonight, our vegetarian friend Jeff is coming over so I thought I’d try out something I’ve been meaning to for awhile now — a savory galette. Basically a quiche without the eggs, it’s pretty much whatever veggies and/or cheeses you want, nestled into a rustic-style pie crust (not baked in a pie plate). I’ve done this before as a sweet variety with apples. 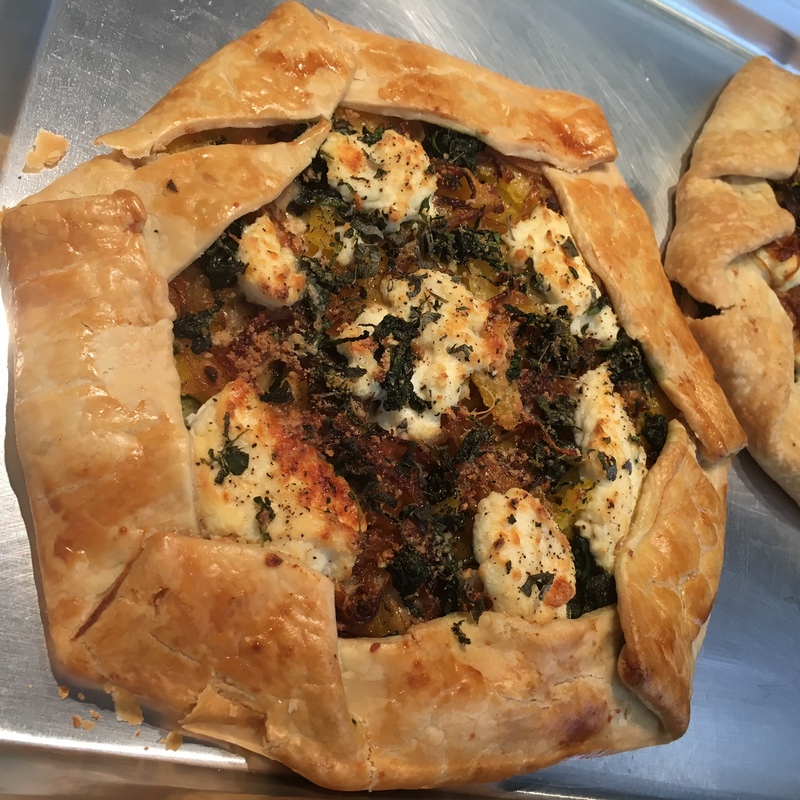 For this one, I used ricotta and Parmesan cheeses, zucchini, acorn squash, caramelized onions, spinach, and topped it with fresh herbs. It came out absolutely delicious! (I do think some good olive oil would have been good to serve it with to drizzle over the top, just a bit). I just served it with a very simple green salad and some warm bread with herb butter. It felt like a great fall meal, but I will definitely start doing more savory galettes throughout the year with different seasonal veggies. In bowl, mix ricotta with salt and pepper to taste. Mix in herbs if you have them. Bake for 30-35 mins or until golden brown.